400 day clocks have a very thin flat wire (about 2 – 4 thousands of an inch thick), called the suspension spring or suspension wire, that the pendulum hangs from. You must be gentle with these clocks to avoid damaging the suspension spring. Before starting the clock, put it where it is to be located. Then unlock the pendulum (for Schatz miniature clocks and many Kundo clocks) or hang the pendulum on the pin at the lower end of the suspension spring. Level the clock so that the point on the bottom of the pendulum is near the center of the cup in the base. Some clocks have leveling feet that you can rotate, on those that don’t you can use paper or cardboard shims under the edge of the base. Gently rotate the pendulum 1/2 turn and release it. During operation, the pendulum makes a slow motion of about one turn, first rotating one way, then the other, every 6 to 8 seconds. NEVER SPIN THE PENDULUM! 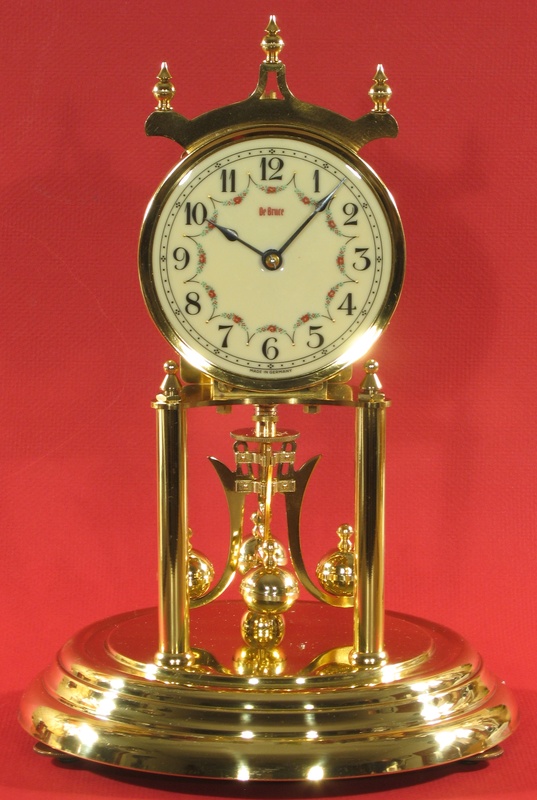 Earlier this year, a customer received a clock from me after repair, and it was working perfectly. Three days later, it stopped, and we could not figure out why. So he sent the clock back to me, and I found that the suspension spring, which should be flat, had over 100 twists in it! My customer was puzzled, but did some checking, and found that his cleaning lady’s grandson had spun the pendulum around rapidly! I replaced the suspension spring and the clock was as good as new.